Roots the Guard, so that it cannot move. When rooted, the Guard heals allied units in his range and gains for each level of this ability a natural healing by 30 hitpoints per second as well as 5% magical damage reduction. 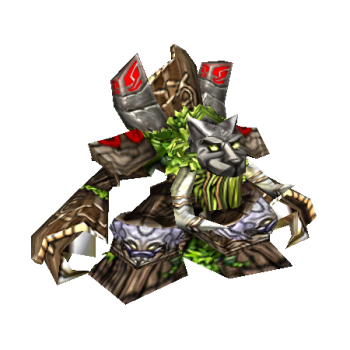 Invokes natural energy in the target area, which heals a certain percentage of the max HP and mana of allied tanks. The Guard receives 50% of the heal when uprooted and 100% when rooted. Spawns 2 treants with heavy siege damage fighting for the Guard. When rooted, 1 treant spawns passively every 20 seconds. Each level increases the strength of the treants. Summons roots, which damage enemies in the target area and entangles them. Air units take 150% damage, but can’t be entangled. The ability is delayed by 0.5 seconds.